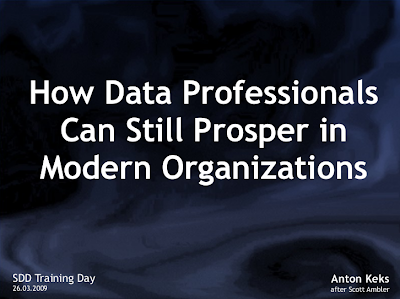 A couple of months ago I have made a short keynote titled Dinosaur Strategies: How Can Data Professionals Still Prosper in Modern Organisations, inspired by Scott Ambler's joke on the fictional Waterfall 2006 conference website. I primarily deal with 'application' aspects of software development using Agile practices, so I have a hard time understanding how some Data Professionals can be so behind in their evolution, and not doing some basic things like iterative development, unit tests, continuous integration, etc. Last week I was asked to give a talk on Database Refactoring. The topic seemed challenging enough and as no Database Professionals cared to lead the topic, I decided to give it a try. The result is a motivational speech for both database developers as well as others in the software development process. Other discussed topics include Refactoring of Stored Code vs Database Schema, Agile Reality, Overspecialization (016n), Database not being under control, Database Smells, Fear of Change, Scenarios, Dealing with Coupling, Dealing with unknown applications, Proper versioning, Continuous Integration using sandboxes, and Delta Scripts (Migrations), which make evolutionary database schema possible. The dinosaurs below are the reminder of my previous keynote available above. They come from the very nice Dinosaurs Song, available on YouTube, which I have actually played after the keynote itself. 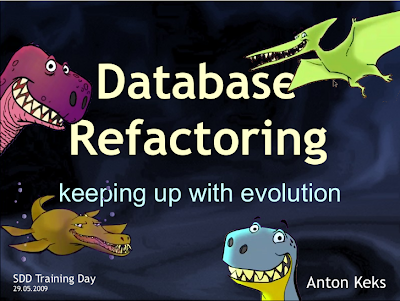 Below are full slides of the Database Refactoring talk. "Development" is not limited to just people who write code. From database developers, documentation writers, and throughout the whole spectrum of the people involved in producing the finished product, all can benefit from new techniques, technologies and implementations. Glad to see this talk on the subject! I suspect you have an error in your "Tools" slide. The tool for evolving your database is not LiquiData but LiquiBase (http://www.liquibase.org/).